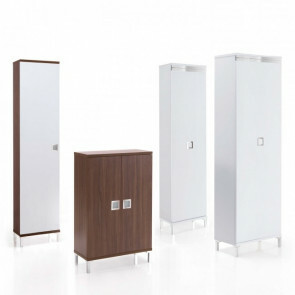 Arcobaleno is a drop-down shoe cabinet in several measurements, with two, three or five doors. Featured by a narrow depth and coloured square handles. It can store from 8 to 30 pairs of shoes. 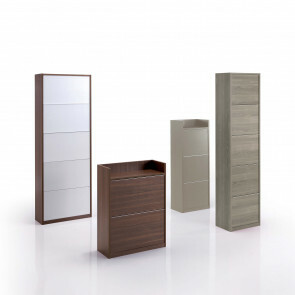 Evolution Wood is a wooden sliding shoe wardrobe with thin metal feet and a wide range of models. One or two hinged doors or a single sliding door. From 18 to 39 pairs of shoes. 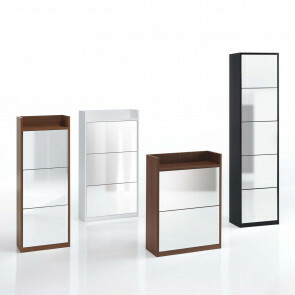 Family Mirror is a modern mirror shoe cabinet with drop-down doors, available in several models and finishes. With two, three or five compartments. Elegant and functional, for 8 up to 30 pairs of shoes. 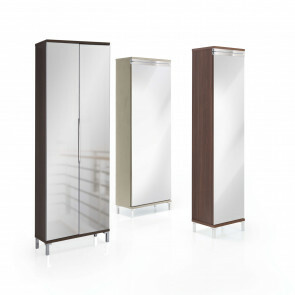 Evolution Mirror is a shoe cabinet with mirror doors, also available with a single sliding door. Wooden or white structure. It can contain from 18 to 39 pairs of shoes. Family Wood is a modern wooden shoe cabinet with drop-down doors, ideal for hallways. 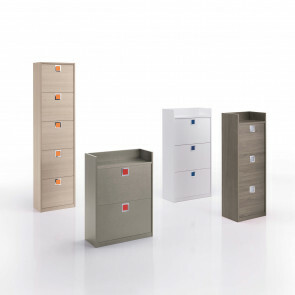 Available with two, three and five compartments, suitable to store from 8 to 30 pairs of shoes. 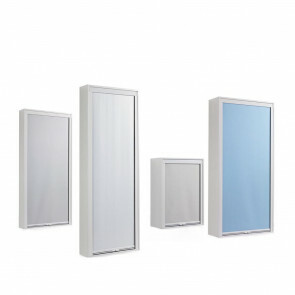 Roll is a slim shoe rack with shutter: big and without doors, it features shutters with automatic roll-up system. Available in different depths, widths and heights, it can contain from 17 to 50 pairs of shoes.